Who is that bald guitar player with super group Them Crooked Vultures? An unknown musician to many, Alain Johannes was sharing the stage with the three super stars. But his record explains the rightful place of Johannes in that band. Not surprisingly he played with Queens of the Stone Age, but the likes of No Doubt and PJ Harvey also used his services. He's widely praised for his virtuous and technically skilled guitar play. He wrote the songs for his solo album Spark after the death of his wife Natasha Shneider in 2008, with whom he founded the band Eleven and who played in Queens of the Stone Age as well. And this way writing for the album was part of his mourning. The record was released in October in the USA with the help of good friend Josh Homme and now finally in Europe too. And with great result. Johannes is showing why everyone is so impressed with his guitar skills. Listen to 'Make God Jealous' where you can only hear the exuberant guitar besides the vocals. Other string instruments pass by as well like a cigar box guitar in 'Endless Eyes'. He wrote this song in memory of his diseased wife for a benefit show. After that one by one the remaining seven songs spawned. With that it turned into a short record of not even half an hour but with the intensity of these songs that's no problem at all. All our beautiful songs that are pleasant to the ear. Johannes has a nice voice that carry the songs. He's playing away his sorrow and besides mourning and remembering is also an ode to his wife. 'Return To You' even is a Beatlesque song with a cheerful melody. But understandably mostly you hear the loss like in closing track 'Unfinished Plan'. Something beautiful can spring from a tragedy as more often happens. 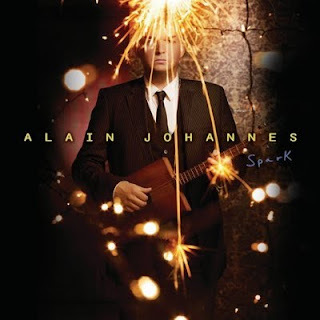 Alain Johannes proves his remarkable talent with this personal record. It won't give him the same stardom as Josh Homme since the music isn't enough mainstream for that. But those aren't his intentions with this album. He will impress many though with these beautiful and emotional songs. Perhaps it can bring other people comfort who have suffered a similar loss and that must be a nice thought for him.